Like the porcelain it's named for, Porcelain Jasper is a result of extremely high temperatures. Indeed, if you'd been around some billions of years ago, you'd recognize this lovely, delicate rock as lowly clay. That's what a few eons of powerfully high temperatures will do. Don't try this at home! 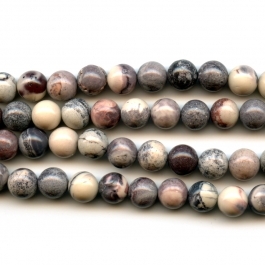 But do try these gorgeous Porcelain Jasper beads. 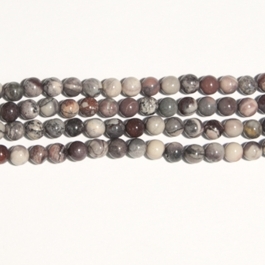 Porcelain Jasper beads boast colors found in few other stones, particularly in this combination. Think of pinks, plums and mauves, veined with a darker grey. The results are sumptuous and stylish. 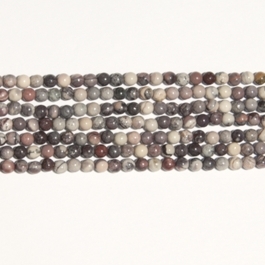 These beads would be especially complemented by silver, whether in necklaces, bangles or bracelets. Share these exquisite beads with your customers and they'll demand more. Jasper, for all it commonness, is actually a wonder. Acclaimed jewelry maker Dale "Cougar" Armstrong takes an entertaining look at the history of and beliefs surrounding of this versatile picturesque stone in a series of posts about Jasper on our Wire-Sculpture jewelry making blog. Click here to read "Gem Profile: What is Jasper?" Wire-Sculpture is committed to keeping thousands of beads for making jewelry in stock, so you always have a source for the beads you need. Experiment with and expand your jewelry making with Porcelain Jasper and many other exciting choices. And remember, if you meet up with a hitch, call our knowledgeable and extremely helpful customer service reps at 877-636-0608 (toll-free).